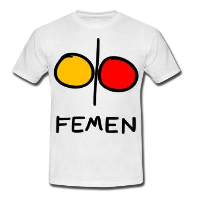 Femen is a feminist group, who fights for women rights, gay rights and equality. I know Femen since a few month and i admire them for their courage and strength. I already made a video of them, but this one is different. This one is on the women, on their persons, and not their fights or theirs actions. I admire them so much for the difficults choices they make. I admire Pauline, Marguerite et Josephine for their action in Tunisia. They went in prison for it. Very strong women.